Homeowners around the state have encountered difficulties with city officials, HOAs and Architectural Boards when replacing their dead lawns with drought-tolerant native landscaping even with Florida Statutes backing their decisions. There have been several lawsuits filed against homeowners who have chosen to move ahead with their FFL yards, yet I do not know of one which has actually been ruled upon. A Florida Friendly Landscape Symposium will be held this Thursday, October 18, 2012 in Citra, FL. Homeowners living in areas with covenants and restrictions or city ordinances who plan to install a FFL yard or are in the midst of a battle regarding their drought-tolerant landscaping should plan to attend this event. Realtors, property management professionals and HOA Board members will also benefit hearing University of Florida experts from different areas of the state. 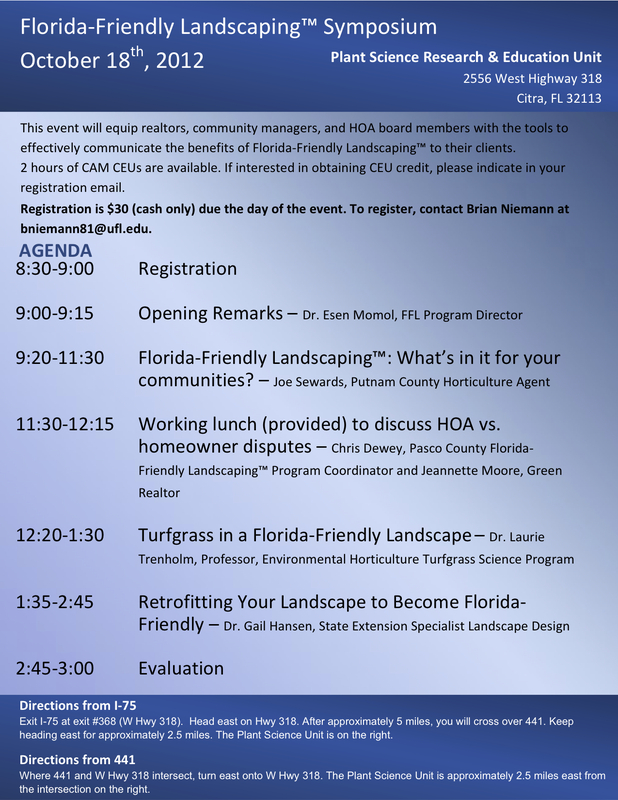 You will also have the opportunity to share your experiences during the lunch-time discussion of Homeowners, Florida Friendly Landscape and HOAs. The symposium will be held in the new Plant Science Reasearch and Education Unit building at 2556 West Highway 318 in Citra, FL 32113. See flyer below for directions and the full itinerary. The fee is $30 which includes the working lunch. Continuing education credits may be available. ‹ PreviousThe Yard Next Door! Wow, you really know your stuff. I will be linking this post to my blog for my readers as well.